The Harcourt Valley Easter Festival is on again for 2019. Held in an idyllic setting at Harcourt Valley Vineyards, the day offers live music, children’s entertainment and a variety of vendors showcasing a range of produce for you to try including wine, beer, cider, cocktails and delicious food. Children’s entertainment includes a jumping castle, giant slide, face painting and an Easter Egg Hunt. 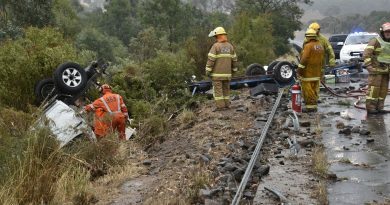 A shuttle bus will run back and forth from the Castlemaine train station to the winery all day for $10 return. The day begins at 11am and concludes at 5pm on Easter Sunday, April 21. To pre-book or for further details contact Marie on 0431 996 515. 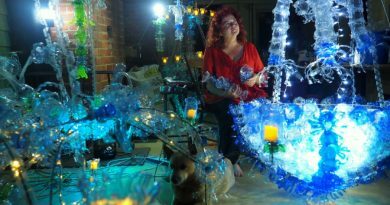 Debra Goldsmith, pictured here with some of her amazing chandeliers, will be among the guest artists for the 2019 Maldon Art Walk. 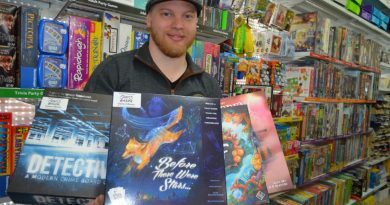 Justin Hallam-Stephens is pictured with some of his new games.